His name is Noel, properly William Noel Hodgson – friends call him Bill. 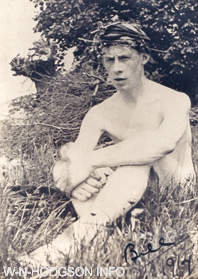 In 1914 he is 21 and a student at Oxford. He’s a writer and a poet. He captains his college rugby team and plays hockey, cricket and tennis; he’s also a keen hill walker who thinks of the Cumbrian fells with a passion other men reserve for their lovers. He enjoys a joke and has everything to live for. In two years time he’ll be a lieutenant in the 9th Devons, fighting in the Somme valley. In two years time he’ll be dead. This book is his story. Today Noel Hodgson is remembered in connection with the first day of the Battle of the Somme – the worst day ever suffered by the British army, when almost 20,000 men were killed in a few chaotic hours. He was one of those men. His battalion was ordered to advance across the slope of a hill and capture a network of German trenches south of the village of Mametz. They already knew the area, having held the trench lines on the hillside for two months. They knew how exposed to enemy fire their position was. Captain Martin of ‘A’ Company made a relief model in plasticine to show the whole area and highlight its dangers and the model was set up at Brigade Headquarters before the battle so that all the officers involved in the advance could study it. Changes were made in response to its findings but nothing could change the lie of the land itself and in that lay the real danger. So Lieutenant Hodgson, Bombing Officer, took his fear of what was to come and spun it into words on paper. He took the sunrises and sunsets and beauties of nature; the lovely cadences of language that he handled so well; he took his memories of past happiness and feelings of inadequacy in face of the coming battle, the overwhelming sense that he was not ready for this, and he set them all down in front of the German machine guns that he knew would be waiting: “Help me to die, O Lord.” Then he folded the poem into an envelope, sent it to England for publication (under a pseudonym), and carried on with his job. Everyone was afraid but no one talked about it; there was no point dwelling on things you could not change. But the poem, ‘Before Action’, found its way home and was published on 29 June 1916, two days before the battle… two days before Noel Hodgson was killed. The coincidence of the poem and the writer’s death, once revealed, made ‘Before Action’ famous and its honesty and bravery struck a chord. There were so many people then whose deepest longing was to reach out to a son or brother, lover or husband, and know how he had felt before the end. It was not a comforting poem. It offered no easy promise of heaven or of any sort of afterlife but it was real, and that reality gave it immediacy and power. It became one of the most loved of the war poems, included in anthologies, broadcast on Armistice Day, even set to music, and though attitudes to the war and its poetry changed through the years it has never quite been forgotten. Before Action uses Noel Hodgson’s unpublished letters and manuscripts, his published writing, family papers, the letters and diaries of other members of his regiment, and other sources to trace his journey from rural Gloucestershire to the Somme, from child to schoolboy, student to soldier. It recaptures the worlds he knew and weaves into his experiences the stories of the people who mattered to him, his family and friends. Grief and remembrance form an inevitable thread in any account of the First World War. Each death in those relentless casualty lists left a circle of family and friends struggling to come to terms with what had happened and to rebuild their lives around their loss. The closing chapter of the book follows the people who were touched by the deaths of Noel Hodgson and his friends – their families, also their school, colleges and communities – and it traces the ways they found to remember. It was an experience so many families shared and their remembrance still shapes the way we understand the war. Before Action is his story… their story… and our story.